Badminton is a 2 or 4 player game played with a racquet and birdie. Played either in an indoor court or casually in a backyard, you can choose to use a badminton net or pass the birdie between teams. With 2 players, referred to as “singles”, and with 4 players, called “doubles”. It’s best to learn the basics of how to play Badminton before you get started so you can develop the best habits to start with. 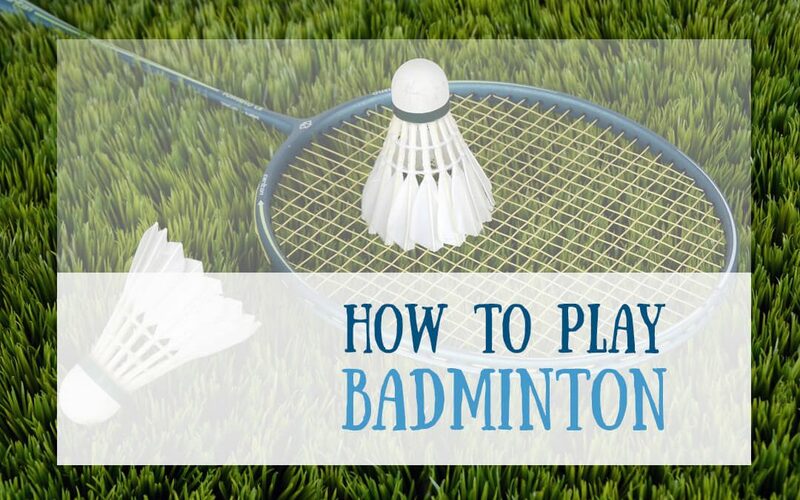 If you already know how to play badminton, keep reading our list of 9 games like badminton. Badminton is very portable, with only a couple racquets and birdie, the whole game can easily fit in a drawstring bag and easily be taken to the park or the beach. If you don’t have a set already, click here to get the latest price. We’ll go through the basics of how to play badminton, how to serve, then the rules for singles and doubles. Up front disclaimer, I really, really love badminton. For all the rules, we will assume that you are playing on a court. Keep in mind that you can transfer the same rules to a backyard game with or without a net. If you are playing at the beach, in your backyard, or camping, there are lots of portable badminton net options. That way you can setup a badminton net almost anywhere. When installing your net, ensure that it stands 5 feet tall and the net should be pulled tight directly across the court. Find an indoor court, or a level area outside on cement, but grass or sand are suggested. There might be some diving in your future and no one wants a cement burn. The badminton court size for doubles is 44 feet long by 20 feet wide, with the net setup 5 feet tall in the middle. So each badminton side is 22 feet by 20 feet. 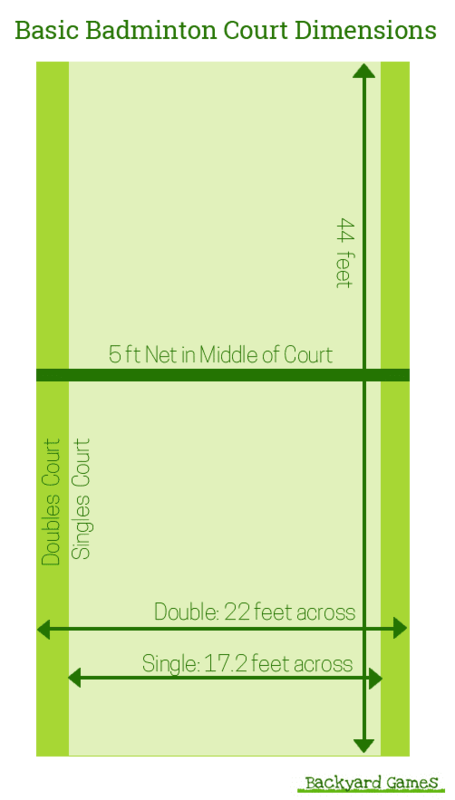 For singles, the court width is 2.8 feet shorter, so will measure 17.2 in width by 44 feet long. That’s all you need to know if you are playing a casual outdoor version of badminton. If you are playing an indoor tournament, there are quite a few lines on the court, so we will briefly explain those below. For indoor badminton courts, there are a lot of lines on the court. Don’t worry, you only have to pay attention to one set of lines. The lines are to to distinguish the different court sizes between singles and double courts. Being that the court sizes are different, there are also different service and side lines. You will notice, that on each side of the net there are 2 boxes now. This creates the “service court” for each player during the game. So when serving, you must stand within the box of the service lines. See below for a visual of the service boxes and how to serve. Badminton is played with a racquet per person and a birdie. The official name of a birdie is a shuttlecock. The birdie is a net in the shape of a funnel, with a rubber half circle at the end. The basics of the game are that you hit the birdie between players using the racquets. When hitting the birdie, always hit the rubber side of the birdie to achieve the bounce effect. The 2 most common ways to hit the birdie are overhand or underhand. 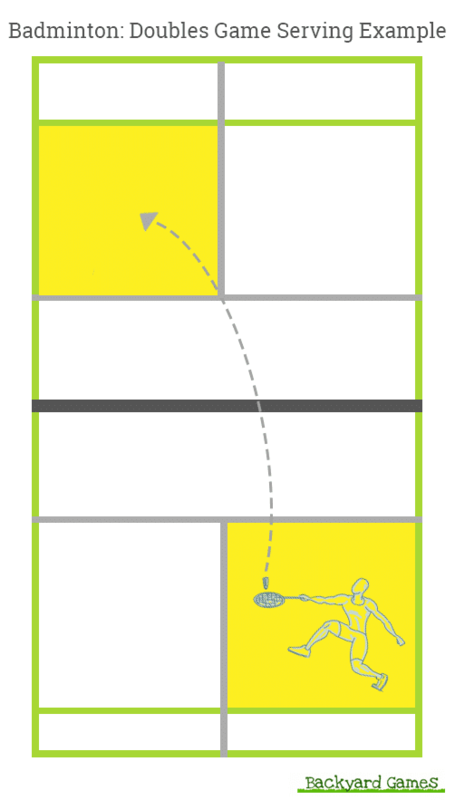 Underhand, you take the racquet and with a swing through motion hit the birdie from below so it bounces upwards. Overhanded, you wait until the birdie is almost in line before swinging overhanded at the birdie. Underhand swings tend to bounce quiet high, whereas an overhand swing will fly direct in the direction you hit the birdie, often with less arch. Once you have mastered the overhand hit, you can try and put more force behind your hit, called a “smash hit”. This will send the birdie flying fast and hard towards your opponent, often without an arc. This is similar to a tennis overhanded hit. You can even practice jumping up to get this shot. After you hit the birdie, always return to the middle of the court. Find movement around the court while staying light on your feet, avoid trying to stay in one place. Focus on small movements around the court so your feet are always light and moving. Think of crab like motions 🙂 . When playing singles, there are no rules about where to serve the birdie. So you can serve the birdie straight down the center line, wide or directly to the receiver. There are four types of serves, low serve, high serve, flick serve, and drive serve. On all types of serves, you must serve the birdie from below your waist. 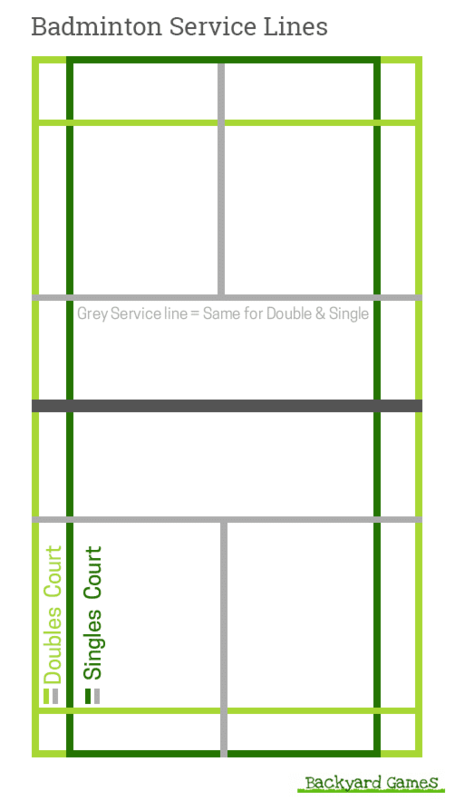 In doubles, the server on the right service court, must serve the player diagonally opposite them. This will be to the player on the right service court on that side of the net. The only player that may return a serve is this player. If the other player hits the birdie instead, the point is awarded to the server. The objective of badminton is simple, be the first player to get to 21 points to win the game. You must win by 2 points. For example, if you are at 20-20, you must win 22-20. In a tournament, you must win the match, which is best of 3 games. You win a point when your opponent does not hit the birdie back to you. So if the birdie lands within the opposite court, on the ground, you get a point. Your opponent has the same goal. You will also get a point if your opponent makes a mistake, for example, hits the birdie out of bounds, under the net, or into the net. – Flip a coin or play to see who gets to serve first. The first player serves the birdie. – You can only hit the birdie once per rally, so you must hit it directly back over the net. If you are playing doubles, it doesn’t matter which team mate hits the birdie, whomever is closest. – If a player hits the birdie out of the court, but the receiving player still hits the birdie, the game is still in play. Only if the birdie hits the ground is a point awarded. – Don’t be afraid to exploit your opponents weakness. Have them running all around the court by first hitting the birdie short, then next hit the birdie long. Don’t always hit to the exact same spot so they get comfortable there. Most players are weak on their backhand, don’t be afraid to shoot towards your opponents backhand. – Master your drop shots. The hardest shot to return is a hard handed drop shot. This is an overhanded hit where you aim the birdie hard and fast at the ground. Played in serious competitions around the world in Europe and Asia, we mostly know Badminton to be one of the best Backyard Games in the United States. It has been featured in our Ultimate List of Outdoor Games and Beach Games for Adults. Fun Badminton Fact: Playing badminton for an hour is an incredible workout and burns up to 300 calories!